Today our Pilgrims were blessed with a few hours extra sleep as our journey from Broken Hill to Port Augusta was one of the shortest days yet. Once everyone was up with tents packed, breakfast had and buses ready to go we headed off to our first quick stop of the day, The Big Chair. Once all photo opportunities were taken, we hopped back on the buses, played some bus games, chatted with one another and drove to our lunch destination, Yunta. Once lunch was over we still had many hours to go before we reached our campsite at Port Augusta. Today, there was a boy’s bus and a girl’s bus. The boys got up to some fun games like “Heads up” and “Clinkers” while the girls bus worked on some music items that they will perform for the group later in the journey. Reflection time was also very impacting on both buses, the young people sharing personal stories on what its like for them back home and how they hope to create a sense of nyuyuni in their lives and for others. 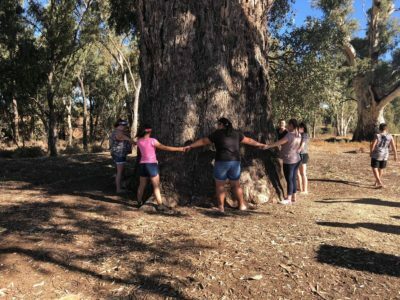 We also thought it would be fun to have a quick stop at a huge tree to see if we could connect our hands to create a full circle around the base. We succeeded! 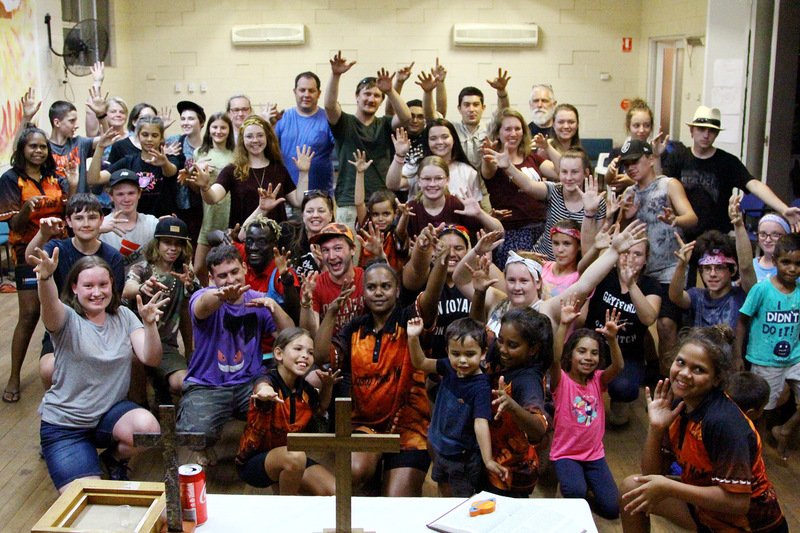 Once we reached Port Augusta we quickly unpacked our belongings and headed off to a very exciting night with the Victorian Bus and the Dusty Feet Mob, an Aboriginal Dance group. It was amazing to see everyone interacting with one another and our Young People making friends with the Victorian bus and locals alike. 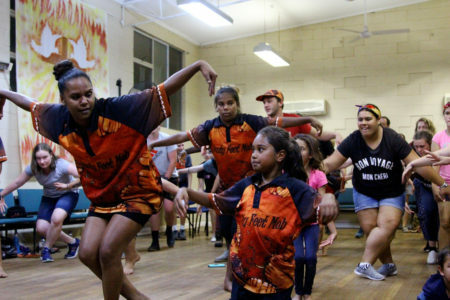 The dance pieces performed by the Dusty Feet Mob were impacting, heartfelt and a beautiful representation of the Aboriginal culture through dance. 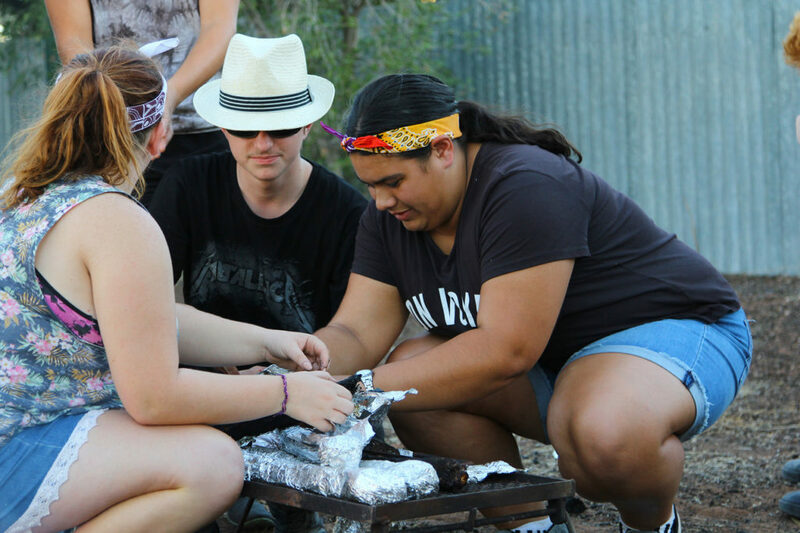 The remainder of the afternoon was spent around the campfire singing songs, eating delicious food including kangaroo tail and playing Ninja with the younger kids in the community. Once we returned to the campsite, we gathered together in a circle and shared our highlights of the day and something we learnt. At 10:00PM, groups were returning to their cabins ready to get great nights sleep, nice and rested for tomorrow’s fun!